Self-service kiosks are gaining popularity in the quick service restaurant (QSR) industry as a tool to improve customer service and make better use of the workforce. Kiosks and mobile device management solutions can save time by increasing the speed of ordering. They can take orders more efficiently, increase order accuracy and reduce the risk of human error. They can also reduce overall friction at the counter, and experts say they can be a great tool for increasing spend and spurring more customer loyalty. Large and small QSRs are already rolling out self-service ordering devices. McDonald’s is introducing self-service kiosks to 2,500 stores by the end of the year and eventually to all 14,000 U.S. locations by 2020. The company says it will improve the customer experience by enabling patrons to browse options at their own pace, and by freeing up more workers to deliver food and interact with customers. More consumers are seeking options for faster ordering and payment, and self-serve kiosks and mobile device management solutions offer the ability for them to control the transaction from start to finish. A survey by Retale found that nearly half of respondents would like to see more kiosks, and 20 percent of millennials don’t even like interacting with cashiers at checkout. Ryan Buell, an assistant professor at the Harvard Business School, told Harvard Business Review that kiosks can significantly change customer behavior. Consumers will often spend more on additional ingredients and may make more requests as kiosks can “reduce social friction,” Buell says. There are typically two kinds of kiosks on the market: enclosed kiosks and tablet-based kiosks. Dedicated, enclosed kiosks typically come as a single unit with a rigid design. They tend to be larger, heavier and can be more complex to install. 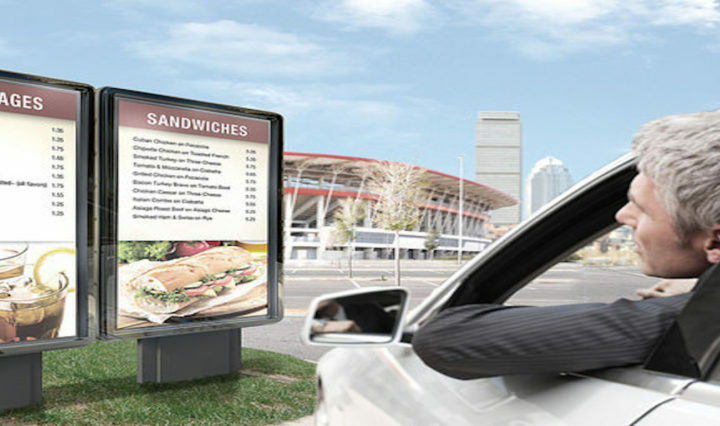 Explore the business benefits of outdoor digital menu boards in this infographic. Tablet-based kiosks are becoming popular because they’re typically smaller, more flexible and less expensive. Restaurateurs have the option to pair devices with accessories and applications that better meet the needs of their operations and layout. With a small, compact footprint, tablet-based kiosks can be placed virtually anywhere, including countertops, walls and even on dining room tables. Enterprise-grade Samsung Galaxy tablets can be easily equipped with apps to enable kiosk functionality. When combined with a card reader, it can serve as a fully functioning self-service POS platform. A number of aftermarket enclosures for the Galaxy can also offer the protection and security of a fully-enclosed kiosk. Galaxy tablets come fully-equipped with Samsung Knox, a mobile enterprise security platform that protects both device hardware and software to offer comprehensive security. Knox can make the tablet kiosk non-tamperable and keep users focused on the task they are doing. This ensures the device is only being used for what the restaurant intended and that payment information is being handled with the highest level of security. With Knox Configure, QSRs can also customize the tablets so they are completely purpose-built for specific POS applications and inventory management. This helps with two main things: keeping the device running as fast as possible with the removal of any pre-installed bloatware, and keeping employees productive by only having the necessary work applications on the tablet. But before a QSR can deploy self-service kiosks, they’ll want to ensure the solution integrates with the point of sale software. They’ll also want a strategy for deployment and to consider how kiosks may change their workforce. Removing a human from the process means the restaurant now needs to count on the customer properly using the technology, and the disconnect from the processes can also reduce the perceived value of staff. “When customers aren’t able to see that effort, they appreciate the service that’s being delivered less, and they value the service less as a consequence,” Buell said. As technology lacks flexibility and human capabilities in solving problems, restaurants must also ensure that they have staff on hand to assist with kiosks. This also makes usability — for both the customer and employee — something to bring into the early planning stages. McDonalds CEO Steve Easterbrook told USA Today that in addition to bringing food to the tables, workers will also help customers with the kiosks. “We can just reapportion that labor into more service orientated roles that we think the customer will benefit both ways,” Easterbrook said. QSRs will also want to ensure they’re taking the highest security measures possible with physical device protection and solutions to prevent tampering and safeguard customer payment information. Knox offers multilayered enterprise-grade security and certified compliance with some of the most stringent information and technology security requirements, as well as customization capabilities that streamline device upkeep and branding. Adding kiosks to your counter or the front of your QSR can be a great way to enhance the customer experience, improve efficiency and optimize the use of your workforce. Download your guide to customizing wearables for a better dining experience and reduced wait times.